A data center or IT room uniquely alters the requirements of a building management system (BMS). This is primarily because of the criticality of IT and its dependence on facility infrastructure. 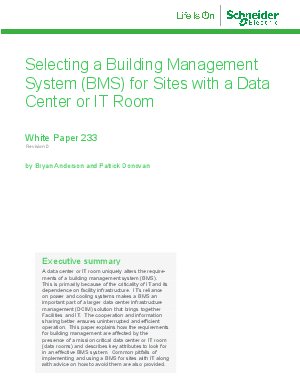 IT’s reliance on power and cooling systems makes a BMS an important part of a larger data center infrastructure management (DCIM) solution that brings together Facilities and IT. The cooperation and information sharing better ensures uninterrupted and efficient operation.